Cook from frozen. Consume immediately after heating. Do not refreeze.Ovens vary, so please use these instructions as a guide only. For fan assisted ovens, cooking times should be reduced. For best results refer to manufacturer's handbook. Preheat oven to 190°C/375°F. Remove overwrap. Cover paper tray with aluminium foil in a tent shape (to prevent cheese from sticking) and place on a baking tray. Bake for 40-50 minutes or until piping hot. Let stand 2-3 minutes before serving. (800 W):Make a 1-inch slit in top of overwrap. 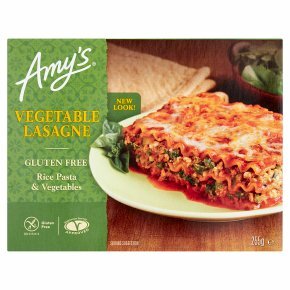 Place lasagne with overwrap in oven.Heat on high for 5 minutes or until piping hot. Let stand 1-2 minutes before serving.